We are very proud of our site and want to ensure we reduce the environmental impact and retain the natural features of the woodland, pasture and riverbank. Our amenities block is timber frame and clad with a high level of insulation. 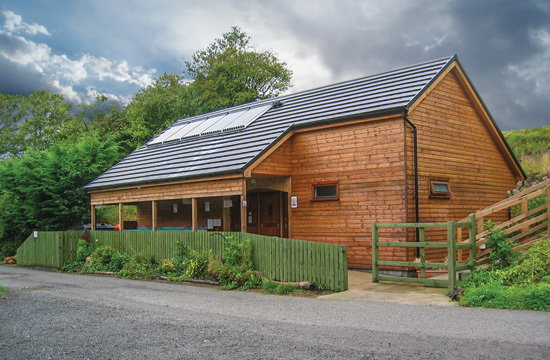 Hot water is provided by Solar panels supplemented by a condensing boiler, which is approved by the Carbon Trust. Under-floor heating is also run from the same hot water system. Water consumption is reduced by the installation of low volume dual flush cisterns for all the toilets. Waste water is initially treated in a septic tank and the outflow taken to a reedbed for further treatment. The chemical toilet waste is emptied into a different drain and stored in the old septic tank and then taken away by tanker. We have an area dedicated to the recycling of glass, paper, cardboard, cans, tins and plastic. Electricity consumption is minimized by the use of low energy bulbs, time-switches and motion sensors to control lighting. All landscaping on site has been carefully planned with the emphasis on the planting of native species of trees and wildflowers. River View Touring Park are aiming to develop a quality touring caravan and camping park, whilst maintaining the charm of its countryside environment. We recognise our obligation to comply with all relevant environmental legislation. We further wish to develop the park, our surrounding countryside and woods for the benefit of the natural habitat.